Celebrate the achievements and contributions of Hispanic Americans in higher education with Diverse! Now, more than ever, is the time to reflect on Hispanic Americans' vitality and meaningful legacy in our Nation’s cultural framework. Diverse’s annual recognition of Hispanic Heritage Month honors the achievements and contributions of Hispanic Americans in higher education. Discussions will include DACA and issues around social justice and social equity for Hispanics Americans in higher education. We’ve got you covered — in print and online. Look at last year's Hispanic Heritage Month Edition. 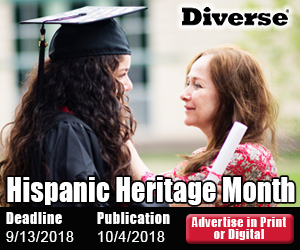 See Diverse articles on Hispanic Americans in higher education.